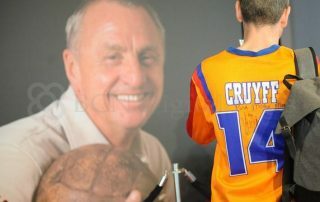 Johan Cruijff tour in Holland, where legends are born! Van Gogh, Rembrandt, Heineken and Cruijff. 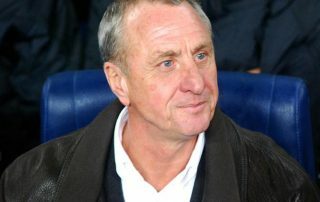 Johan Cruijff was born in Amsterdam. He learned to play football on the city’s streets. We still can see his influence on how soccer is played all over the world. Pelé, Cruijff and Maradonna. The three biggest football players from the 20th century! As we tell you his life’s story you can soak authentic Amsterdam street football culture vibes. If you want to go by car with private driver/private guide it’s € 195,- (max 4 people). Please send an email. The price of € 195,- is excluding Stadium Tour Tickets. Incl. hotel pick up and drop off. The Johan Cruijff tour commences with your Amsterdam born guide in the east of Amsterdam. Do you like football, its history and culture? Then this fantastic tour featuring one of world’s best alltime players is for you! 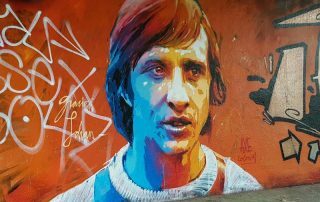 Johan Cruijff was born in the east of Amsterdam in 1947. You will see the wonderful architecture of this place. 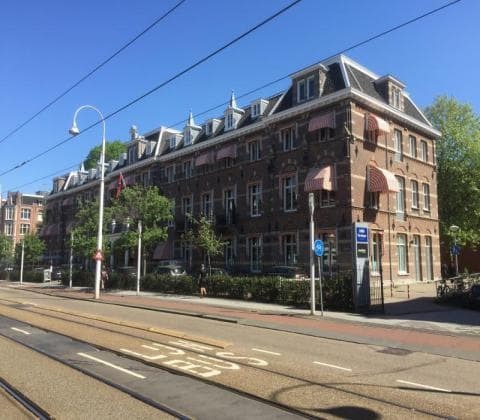 The architect of this building is the same as The Music Hall (concertgebouw in Dutch) at Museumplein close to the Van Gogh museum. Where did Johan Cruijff live? 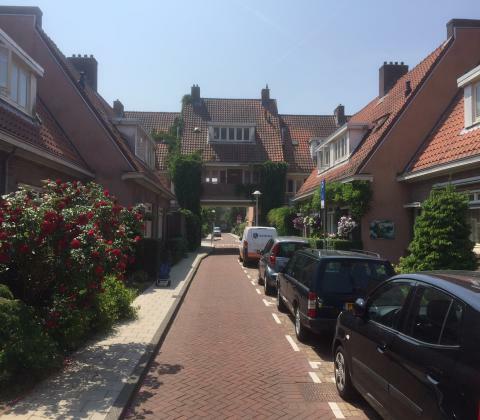 We bike to the house where Johan Cruijff lived in his childhood. 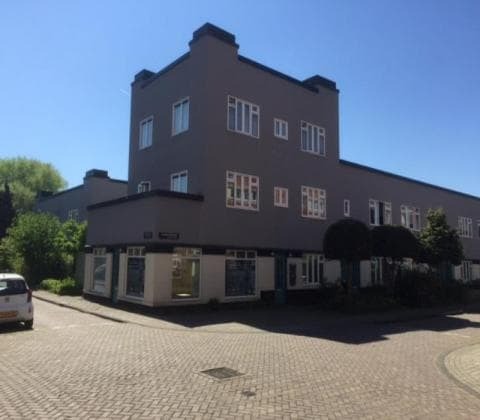 The architecture in the neighborhood is uncommon for what you are used to seeing in Amsterdam. 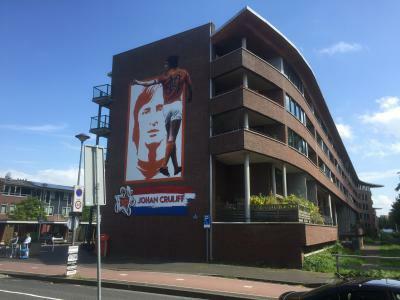 There a some typical Cruijff quotes outside the house. You will have time to take a selfie in front of the house of one of world’s biggest football legends ever. 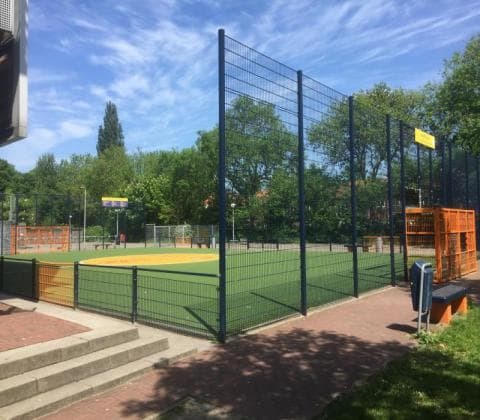 People in Holland learn to play football on the streets. That’s where we make friends and learn to play outside with children from other cultures and develop our social skills. Feel the street vibes and discover the real authentic old Amsterdam local people feeling which is rare nowadays. 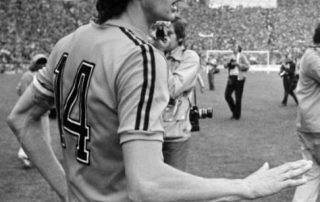 Where did Johan Cruijff attend school? His primary school is close by the house where he lived. Why did his teachers get annoyed at him? Did he complete his schooling? 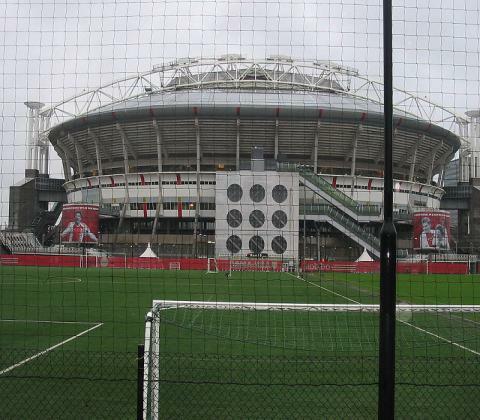 The old Ajax stadium called De Meer was where Johan signed his debut professional contract with Ajax? What was his influence on the team back then? 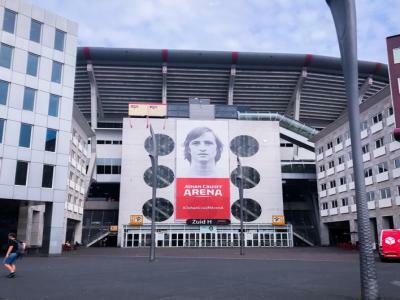 This stadium was where Ajax wrote history winning the European Cup (nowadays the UEFA Champions League) three times in succession. 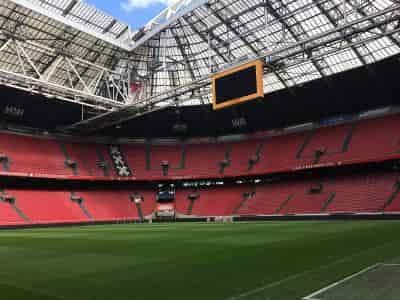 We show you the symbol of the old centrespot of this authentic stadium and streets such as Wembleylaan, Delle Alpihof, Bernabeuhof and Anfield Road. 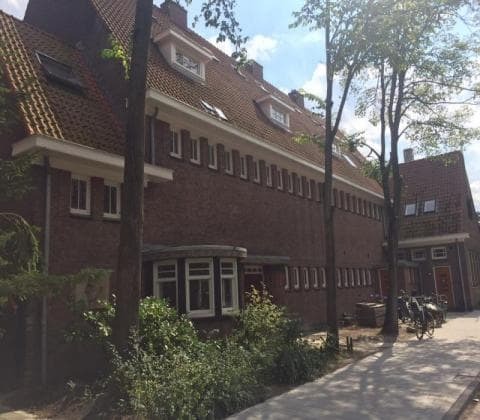 We show you the Cruyff Court close to the house where he lived. Those courts are now located all over the world, from Japan to the USA. 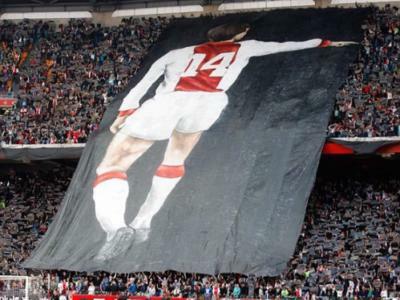 This is an initiative from Cruyff after his career. To offer(disabled)children an opportunity to play outside together. 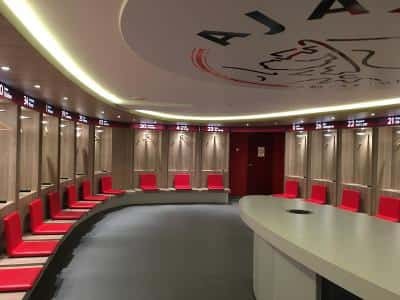 The Johan Cruijff Arena tour offers a great photo opportunity for a selfie in the Ajax dressing room. 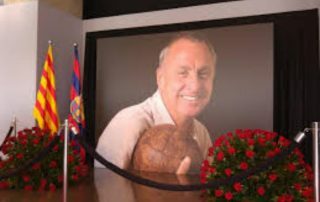 You can see all major trophies Johan Cruijff won in the Gallery of Fame. Visit the media room and touch the holy green grass of the pitch. Get a unique insight into Amsterdam and surrounding history and contemporary culture from our local English-speaking guides. 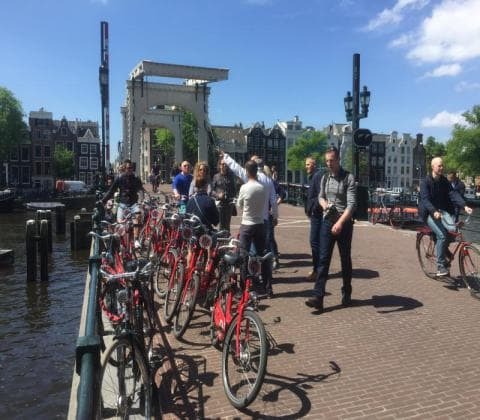 Amsterdam Bike Tours guides are passionate, entertaining, and guaranteed to ensure your ride around Amsterdam is a fun and memorable experience. How do I get my tourticket? Once your booking is confirmed, you will receive an email containing your booking voucher/invoice. Please print it or download on your smartphone/tablet to show the tourguide on day of the activity. We bike rain or shine. We have ponchos available if required. Do we bike on busy roads? We avoid busy roads as much as possible and use a mix of bike lanes & quiet back streets. This tour is designed to be as safe and scenic, suitable for all cycling abilities. 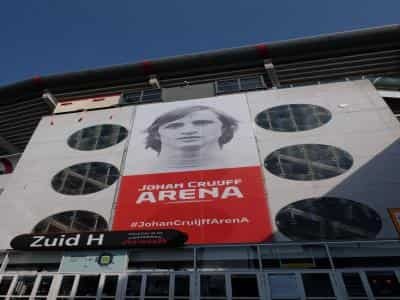 Whats excluded in the Johan Cruijff Tour? Whats included in the tour? 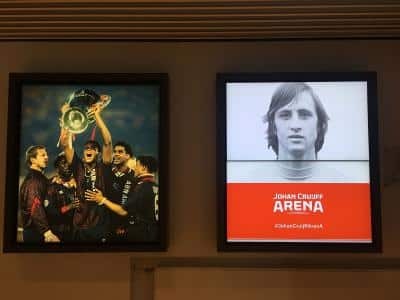 We end up at the Johan Cruijff Arena stadium, from there you can easily take the train back to Amsterdam city centre (10 min) or any other direction you want. 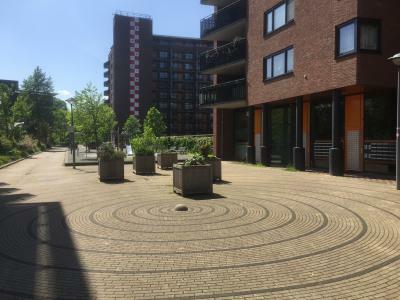 Your meeting point for the Johan Cruijff Bike Tour is in front of the Pathé Cinema which you find at the exit of trainstation Bijlmer Arena Amsterdam. Check also google maps on your tour detail page. The tour takes about four hours inclusive a short refreshment break and 75 minutes stadium tour. 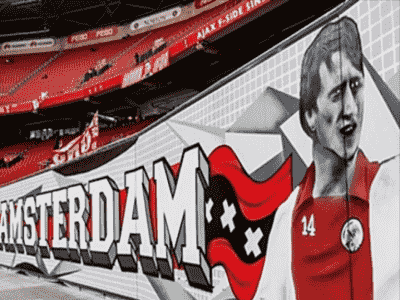 What time does the Johan Cruijff tour start? We start Monday-Saturday at 11:00 am near the Johan Cruijff Arena. Can I reschedule my booking and if so, how? Sure you can, till 48 hours before. Please contact us by email or whatsapp. Is it possible to do a private tour as a group? Yes, it is. Please contact us by email or whatsapp for a tailor made proposal. Yes, our online payment system is 100% secure and encrypted to protect it against fraud and unauthorized transactions. We have never access to your credit card or bank details. You can pay securely online using several creditcards, Paypal, Sofort or iDEAL. You can always try and give us a shout or send a whatsapp, but no guarantees of course. When to book this tour? Book as soon as possible to guarantee availability, especially during public holidays and festivities. You can book up until the previous day (12:00 local time) if there are still places available. Do I have to be fit to do the bike tour? During the bike tour, you’ll pedal for approximately 20 kilometre (13 miles), so you don’t need to worry as the Johan Cruijff tour is very easy to ride and we take it easy. 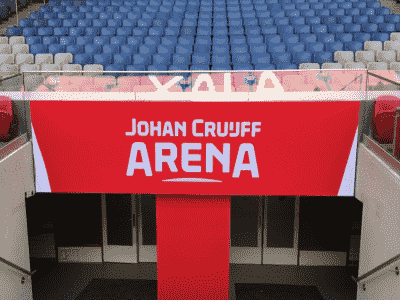 Where do I get my ticket for the Johan Cruijff Arena stadium tour? Your guide will arrange your stadium ticket and hand it over to you. Get the best views of his life in Amsterdam.